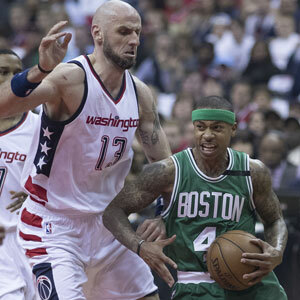 All eyes were on Boston Celtics point guard Isaiah Thomas in Game 1 of the second-round NBA Playoff series against the Washington Wizards — and not just because he scored a game-high of 33 points! Even more dramatic was the moment his jaw collided with an opponent’s elbow, sending one of his front teeth flying out of his mouth and onto the floor. Press reports said the Celtics’ team physician attempted to reinsert the tooth, but it didn’t remain in place when Thomas resumed playing the game. Over the next several days, he reportedly underwent a total of ten hours of oral surgery, and was fitted with a four-piece temporary bridge. A statement from the team noted that Thomas suffered “a complete fractured tooth and two other subluxed/shifted teeth… [He] will receive a permanent bridge at a future date.” So what does all that mean? When we say a tooth is fractured, it means the crown (visible part) of the tooth has broken off from its roots, either above or below the gum line. Depending on the severity of the fracture, it is sometimes possible to save the natural tooth by performing a root canal to prevent bacterial infection, and then placing a crown (cap) on the tooth to restore its appearance and function. In more severe cases, however, the tooth can’t be saved and must be extracted. Unfortunately, that isn’t Thomas’ only problem. He also has two subluxed teeth — that is, teeth that have shifted from their original position, but haven’t been knocked out of their sockets. Subluxed teeth often result from a severe blow to the mouth, and may be treated by stabilization or splinting. Team officials haven’t said exactly what was done during Thomas’ dental treatment, but it could very well have involved extracting the roots of any teeth that couldn’t be saved, and possibly placing dental implants in his jaw for future tooth restoration. A dental implant is a small screw-shaped titanium post that is inserted directly into the bone of the upper or lower jaw in a minor surgical procedure. In time, it becomes fused with the bone itself, offering a sturdy anchorage for replacement teeth. One implant can support one replacement crown; two or more implants can support a number of replacement teeth joined together as a unit. This is called a dental bridge. Bridges can also be supported by adjacent healthy teeth — but first, the outer surfaces of the crown must be prepared (reduced in size), so that the bridge can be attached over the remaining part of the crown. In many instances, implants are preferred because they do not compromise the structure of healthy teeth nearby. Dental difficulties didn’t end Isaiah Thomas’ season — but an earlier hip injury that became aggravated finally did.Â As unfortunate as this is, maybe now at least the NBA star will have a chance to let those injured teeth heal, and show up next season with a smile that’s as good as new. If you have questions about treating injured teeth, please contact us or schedule an appointment for a consultation.